Is Britain's economy in safe hands with the Conservatives? 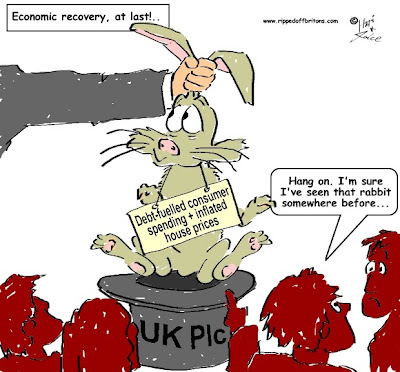 Back in July 2014, the Conservatives celebrated that Britain’s GDP had exceeded the pre-recession peak. Later adjustments by the Office for National Statistics (ONS) showed it had actually reached this level 9 months earlier, in Q3 2013! How good was that! Actually, much less good than you might think. It’s not just the remarkable slowness of the post-2008 recovery. This graph by the National Institute of Economic and Social Research (NIESR) shows the downturn starting in 2008 lasted far longer than any in the previous 100 years. It’s not even that ONS figures for Q4 2014 show GDP per head is still 1.2% below the pre-downturn level. The GDP recovery, such as it is, hides a far more dismal figure: the Net National Disposable Income (NNDI) per head. NNDI provides a measure of the actual income going into the pockets of UK residents, once the Rest Of The World has taken its share. Figures from the Office for National Statistics (ONS) report titled “Economic Well-being, Quarter 4 (October to December) 2014” showed that at the end of 2014, in terms of NNDI we were still over 5% worse off than pre-crisis. In real terms, we Britons are hardly any better off after 5 years of Austerity. How can this be? The Gross Domestic Product (GDP) measures how much Britain is producing. It does not tell you to whom the fruits of all the products go. An awful lot actually belongs not to any of us in the UK including our own indigenous fat-cats, but to "Rest Of The World" overseas investors. “The lower income received by UK residents on their overseas FDI [Foreign Direct Investments] can be attributed to falls in both the stock of assets UK residents’ hold, and the rates of return on those assets. In contrast, foreign residents have continued to expand their holdings of UK assets”. This expansion of foreign holdings is illustrated in another ONS report, “Ownership of UK Quoted Shares, 2012”. This shows by 2012, 53.2% of shares on the UK stock market were owned by the “rest of the world”. The graph below shows considerable increases in foreign holdings of UK stocks since 1994, with a large leap in the years following the 2008 Banking Crash. The impact of this is evident from the graph below, using ONS “UK Economic Accounts” data for Net Income From Abroad. This shows the difference between income received from UK investments overseas, minus the income sent overseas for overseas investors in the UK. Illustrating the nose-dive into nearly £40billion deficit in 2014. “The key reason living standards have recovered so slowly has been weak earnings growth. In the long run, policies that boost productivity, and so increase real earnings, are likely to have a bigger impact on living standards than changes in tax and benefit rates." "The income estimate measures the incomes earned by individuals (for example, wages) and corporations (for example, profits) directly from the production of outputs (goods and services). " The low wage 'recovery' seen in the last five years has indeed boosted GDP to pre-recession levels. But the boost went largely to the corporations. And the corporations belong largely to our friends overseas.